When Xiahou Dun receives damage, he can turn his character card parallel to his health card. When he is in this state, he cannot be damaged. 1.) Select X cards that belong to the character currently playing their turn and discard them, X being the difference between Xiahou Dun's maximum and current health levels. 2.) Select any character. This character is considered to have been attacked by Xiahou Dun. "Indignation" does not protect Xiahou Dun from negligence damage and cannot be activated when he receives it. Although "Avenge" is not enforced, Xiahou Dun must still activate this ability at the end of a character's turn if his character card is in the parallel position. Also, this ability goes into affect after the character's discard phase. When Xiahou Dun activates option one of "Avenge," he can select equipped or hand cards to discard, but he cannot discard pending judgement cards. When Xiahou Dun activates option two of "Avenge," he does not need to select the character who is finishing their turn to attack. Also, Xiahou Dun does not need to play an Attack card - he essentially gets a 'free' Attack. Also, Xiahou Dun does not need to select a character in his attack range. Finally, Xiahou Dun can use weapon effects when using this ability. The Attack produced by option two of "Avenge" has no color and has no element. Xiahou Dun's "Avenge" gives him more options than the original Xiahou Dun's "Unyielding." Xiahou Dun makes the choice between attacking and discarding cards, whereas "Unyielding" give the victim the choice between taking damage and discarding cards. Also, "Avenge" does not depend upon the successful flipping of a judgement card. Xiahou Dun can use "Avenge" to attack a character that did not damage him. This is useful if an ally inadvertently damages him during their turn. Also, Xiahou Dun can concentrate multiple attacks on one character if he is damaged on multiple consecutive turns, whereas the original Xiahou Dun does not have this option. 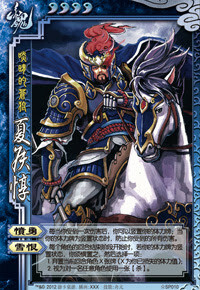 Xiahou Dun selects the cards to discard when "Avenge" is activated. The original "Unyielding" give the victim the option of which cards are discarded. "Indignation" prevents all damage done to Xiahou Dun after he receives damage. This is useful in preventing him from being damaged multiple times in one turn. Much like the original Xiahou Dun, SP Xiahou Dun does not have much to offer a team. The only way to activate this ability is to damage Xiahou Dun. Allies will generally try to avoid doing this. Xiahou Dun's abilities cannot be activated multiple times when he receives multiple units of damage. Option one of "Avenge" is not useful when Xiahou Dun is only missing one unit of health. Also, option two of "Avenge" is not as strong as "Unyielding" as "Unyielding" allows the original Xiahou Dun to directly damage the target instead of simply attacking them. Zhu Rong/Cao Cao/Yuan Shao - These characters can more easily play Barbarians and Hail of Arrows than the average character. 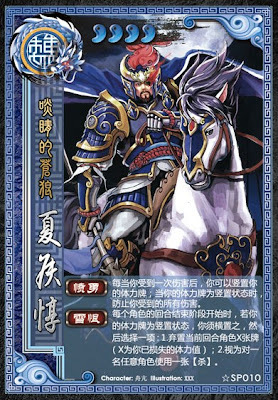 When they damage Xiahou Dun with these cards, he can activate his abilities to attack any character. Zhang Chun Hua - Zhang Chun Hua's "Unfeeling" is detrimental to SP Xiahou Dun's "Indignation." As stated previously, SP Xiahou Dun cannot turn his character card to its parallel position when he receives negligence damage and "Indignation" does not protect him from negligence damage. Cai Wen Ji - Cai Wen Ji's "Lament" is activated when a character is damaged via an Attack. This gives her and her team a defense against against option two of "Avenge." King Xiahou Dun is better as king than the original Xiahou Dun, but he is still not outstanding in this position. Loyalist Xiahou Dun is a good loyalist. He can use his abilities to try to finish off weak rebels. Rebel Xiahou Dun is a good rebel. He can use his abilities to attack the king more frequently. Spy Xiahou Dun is a good spy. His abilities are good deterrents. "When Xiahou Dun receives damage, he can choose to prevent all damage done to him for the rest of the current turn. At the end of this turn, Xiahou Dun can choose to discard X cards of the character who just finished their turn or select any character and they are considered to have been attacked by Xiahou Dun."